The passivation process is a phenomenon that exists in nature. It consists in the constitution of a sort of protective "film" on the surface of certain metals. This film protects against the formation of corrosion phenomena and is formed by the same elements that cause them. In this way, the film wraps the material, leaving the "vulnerable" part protected from corrosive agents. To allow an adequate protection, this coating must have some characteristics: it must be dense and not very porous, so as to prevent the passage of corrosive agents, and thin, so as to increase the capacity of compactness. It must also be uniform, since it must protect the entire surface of the material in the same way. It is therefore clear that the conditions for the formation of passivation are difficult to achieve in nature. For this reason, action is taken, acting on the chemistry of the metal to achieve in a few minutes results that would be obtained only after years leaving the natural components to act. Passivation is therefore an electrochemical process. Some metals have this natural protection against oxidation, such as stainless steel. For others, however, it is necessary to intervene artificially. Bama deals with the passivation process applied to the most diverse materials, including stainless steel, aluminum, carbon steel, copper, nickel, zirconium and titanium. The artificial passivation process therefore consists of the artificial formation of a protective passivating film. It can be considered the chemical treatment par excellence for the protection of metal surfaces. It is important that passivation only takes place following previous processes aimed at decontaminating the object as much as possible, as in the case of pickling and degreasing. Only in this way, in fact, the passivation can act on a surface free of contaminants and thus create a dense and compact oxide. Just like other treatments, the methods used are immersion and spray passivation. 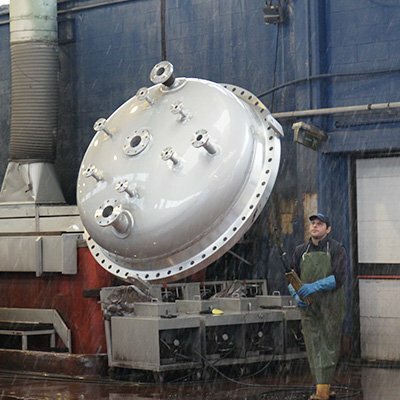 With the first method, the object is immersed in a tank containing solutions formulated according to the type of alloy to be protected, all in compliance with international standards. With the spray technique, on the other hand, the object is invested in by means of low or high pressure rain systems.